This story first appeared in CounterCurrents.org and is reposted here with kind permission of editor Binu Matthew. More than ten years back I had travelled with my friend Saratchandran to a coastal village in northern Kerala to screen one of my films to the villagers. The beach and road we walked through are no more and they have been covered by sea today. Also when I walked through the beaches of Veli in southern Kerala, polluted by a Titanium factory nearby, I remembered that some of the houses which used to be there few years back were under my feet. On the shore nearby, you could watch the remnants of destroyed houses as monuments of invasion by the sea. During the monsoon last year, over a dozen houses were washed away in Thrikkannupuzha in Alappuzha district. In Anchuthengu in southern Kerala and some of the villages in Kanyakumari district, the destruction has been graver. Very soon, the entire Kuttanad will be under the sea, since this area is already under sea level and the distance between sea and the backwaters is only a few metres in some places. It is a great irony that the life of the famous rice bowl of Kerala and the main symbol of ‘God’s own country’ campaign of the Tourism Ministry in Kerala, is now limited to only a few years due to climate change. The states of Orissa, Pondichery, and West Bengal also report similar stories. For the 8,000 residents of Baliwara and other villages in a little island called Mousuni, facing the Bay of Bengal, the debate on climate change is no academic exercise. The rising sea levels have destroyed several homes in the region. Similar threat is also faced by the thousands who live in the 12 sea-facing islands of South Parganas district in West Bengal. south India, who are beginning to see the impacts of global warming at close quarters. If you travel along coastal Kerala, you will find that they have dumped huge stones as sea walls along the coast. Stone walls have been constructed on about two-thirds of the coast in Kerala’s coastline of 590 kilometres. You can see with your own eyes that these walls have been eaten away by the sea in many places. For the critics of climate change debate, who view the debate as a piece of unscientific imagination, it may be wise to visit these regions. The sea wall has interfered with the livelihood rights of the fishing community. The fisher people claim that the sea wall cannot protect them. It can only contribute to further destruction of their lives in many ways. But it has contributed to the earnings of some of the contractors and politicians. It is also ironic that almost ninety per cent of the mangroves and sand dunes of Kerala which contributed to a natural protection mechanism to the invasion of the sea have been removed in the mad rush for development. The sand mining has certainly contributed to the invasion of the coastal land by the sea, in some cases. Activists are trying to rebuild mangroves, providing some positive results. However, I don’t know how sand dunes can reappear. The role of climate change in the destruction of houses and livelihood of the coastal community in many places is no more a drawing room discussion. The cause of increasing sea levels may be a subject of debate to some. But it is a living reality threatening the lives and livelihood of more than 1 billion people living in low–lying areas around the world. This disaster assumes an immediate requirement to a serious discussion with the participation of the people, to avoid the displacement and livelihood rights of millions of people. Yet, why is coastal community leaders not represented in any of these discussions? The coastal communities complain that the climate change has affected the traditional prediction models of the community. The knowledge base of a community is accumulated through hundreds of generations. Climate change has disrupted the indicators of these knowledge systems. Once, they knew very well which fish to catch in which season. Today, their calculations of fishing are getting uprooted along with physical displacement due to climate change. 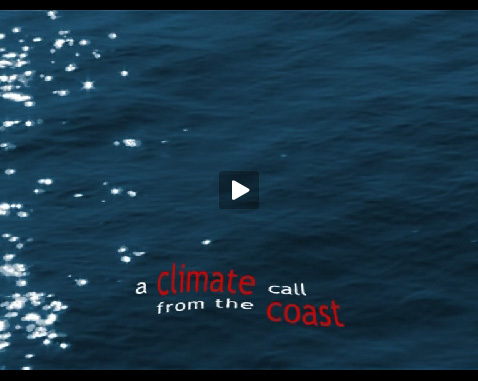 The slightest change in temperature can affect sensitive species within the marine ecosystem. The yield of oil sardines which used to be in abundance in the sea on the coastline of Balasore district in the state of Orissa could not be located in recent times. The rise in temperature of sea water near the coast has affected the habitat of oil sardines. Lack of proper rainfall and rise in temperature have also increased the salinity and temperature of sea water. The fishing community complains that such changes have caused several breeds of fish to refrain from coming towards the coast. The rising sea levels are also causing salt water to flow into many areas, threatening the ecosystem and converting many farmlands to barren lands in the eastern region of India. Much of the cropland in India is close to the sea level near the shore. The intrusion of salt water along with its effect on ecology and human health has already created agony in many parts. The fishing communities are among the first of the climate refugees. But if we raise this issue, there are two immediate problems that must be dealt with. 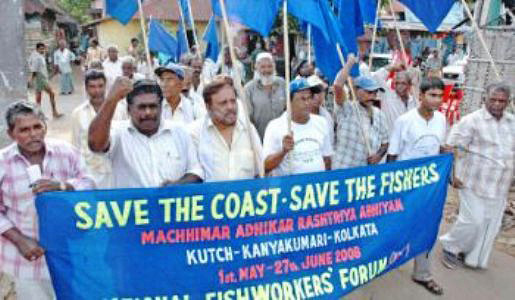 The scare without political solutions to a fishing community is of no help, and a lobby comprising of the Government, international agencies, and a number of commercial/industrial organizations can use the scare to effectively remove a fishing community, and thereby add further misery to the existing problems of the community. They have effectively done this, using the Tsunami scare to displace many coastal villages in the state of Tamil Nadu. Many of the culprits are looking forward to the discussion on climate change from this point–of–view. Thus, like any other disaster, the issue of climate change also can be a boon to many. If past disasters are any indication, then climate change will only provide luxuries to some, while wiping out a large population in many ways through floods, storms, disease, loss of crops, and hunger. With one sixth of humanity residing in the Indian subcontinent, no Government, or NGO will be able to deal with the disaster unless certain major political issues are resolved. The average Indian produces one ton of carbon dioxide each year compared to the average American’s 20 tonnes. While per capita emissions are low in India, but because of its huge population, India is already in the map of world’s leading emitters. However, the low per capita emissions of an Indian has already provided powerful arguments to the Government of India as well as many NGOs in the international community. I do believe that the main role of the developed world in contributing to emissions has to be strongly brought out, and they have to be made accountable. But at the same time, I find it a problem to take per capita emission as a criterion to determine the role of the emitter. It is as absurd to say that per capita income in India is an indication of development. We have some of the richest people in the world and some of the poorest people in the world. This difference is only increasing and the existing indicators of per capita only serve the purpose of washing away these differences. Secondly, who is this average Indian determining the rate of emissions? The divide in India is huge. A large section of the adivasis (the indigenous people), dalits, fisher people, and traditional farmers live with practically insignificant emission, and where it happens, it is nowhere near the rate of one ton of an average Indian. They are also contributing a lot to the reduction of carbon dioxide through their sustainable practices. But a small minority in this country are emitting as much as their American partners. On the other hand, many of the hazardous industries which have come here as a part of imitating the western model of development, have gone worse in their pollution standards than most of their western counterparts. The chemicals banned in the United States and many other developing countries are not only produced and widely used in India, some of them are actually produced by the Indian Government. Which Indian are we talking about? Why does one Indian representing a hazardous development model become a threat to the existence of another Indian who tries to live in a sustainable way? India has already objected to any legally binding emissions reduction targets. The main grounds include the above understanding of per capita emission of an average Indian. The other notion includes the fact that historically the west has caused the climate change and too many western countries have not met their obligations where there was an agreed baseline on emissions. This I believe is an extremely crucial argument of the Indian Government which needs to be supported. But at the same time, the Government of India as well as all the state governments are doing their level best to promote emissions through various hazardous industries. While the destructive development model promoted by the governments and industrial lobbies keep on contributing to the growth of carbon emissions, a large section of adivasis, fisher people, dalits, and traditional farmers whose emissions of carbon are close to nil, are getting wiped out. India is planning to spend 200 million dollars to protect its forests as a step towards dealing with climate change. However, it is not clear what kind of forestation the government has in mind. At a time when the existing programmes to promote monoculture in the name of forests have generated wide–scale ecological and social hazards, this agenda will always be seen with suspicion by the activists. In any case, when the rate of depletion of forests in India is something that cannot be guarded by the forest department, the political mileage for the existence of forests in India need not be a strong point for the negotiation of the State. The adivasis function as the main protectors of forests. Instead of strengthening the conservation culture of the adivasis, the State has done everything to marginalize this population. Forests also function as the main link between adivasis and fisher people. The humus from the forests brought down to the sea through a number of rivers is absorbed as one of the main sources of food by the fish populations in the rivers as well as in the seas. My first concern is when you search for answers to the climate change issue, the most used answer today among many groups is that ‘we must change our lifestyles.’ Though I agree with the concept one hundred percent, I am extremely uncomfortable when changing the lifestyle becomes the central call for action. The lifestyle of any modern society is intrinsically determined by the State and Capital. The State allows a particular product to be produced, however dangerous it may be, and the corporate world produces it and markets it in such a way that the need is created. Therefore, we don’t have possibilities of making much difference in giving calls to change the lifestyles of individuals, unless the call is part of a political agenda to change structures. I’ll illustrate my point with couple of examples. When Gandhi called for boycotting British clothes and urged for the use of Khadi instead, it was placed as a part of the agenda of the freedom struggle against the British. If the central agenda was Khadi, it would not have made any impact and that is the status of the Khadi Board today. In contrast to this, a large number of people in Kerala boycotted Coca Cola in support of the people’s struggle against Coca Cola in Plachimada. Many universities in the United States banned Coca Cola in support of the struggle in India against the multinational giant. The moving factor in these actions was not the fact that Coca Cola was a hazardous drink, but the spirit of an affected community struggling against all odds placed by the powers of a multinational giant. If the people’s movement against the Coca Cola plant in Plachimada, Varanasi, and many other places were not alive, the campaign to boycott Coke would not have made much effect. And in spite of all this, what Coke had to do was to release some more Ads in the television involving prominent film stars like Amir Khan. Unfortunately the ads using mega stars have a capacity of shaping the lifestyles in this country. From this blatant truth that we face today, if we look for answers for climate change and reduce it to a campaign to change lifestyles, we’ll make the mistake of keeping a blind eye to some of the central issues of politics. Unless the campaign is associated as a part of the struggle against the structures that cause climate change, the main catalysts of destruction will roam around freely. The main responsibility for climate change lies with the hazardous, unsustainable production processes of industry, energy, and agriculture. More than 75% of the emissions are caused by environmentally unsustainable agriculture, unsustainable industry, and unsustainable energy production. The remaining can be called the contribution from lifestyles and we don’t need rocket science to understand that today’s lifestyles are decided by the companies to make profit. This is true for all countries irrespective of nation state boundaries. Therefore, it is time to mobilize politically for a restructuring of the production process. We need an equitable, sustainable production process in every sector of life, a production process which functions to sustain life rather than increasing profits for a few. Any campaign for an alternative lifestyle should be projected as a part of this structural revolution. Though externally bound by an Indian identity, I feel close to the sustainable experiments and traditions within the developed world than the lobby of destructive development which functions solely to increase their profits within India. This is where the groups which involve in climate change debate purely within a nationalistic framework have to question themselves. However, since the destruction is more in the developed world, the developed world has to be made responsible. If we leave this task entirely to the representatives of our nation states, our future will be very limited. There is also a disturbing development in India – the push by the pro–nuclear lobby to offer nuclear energy as one of the alternatives to the problem of climate change. If India is genuine to the concerns of the environment, immediate steps must be taken to halt all further developments of nuclear plants in India. The production process of nuclear energy has already created cancer and genetic disorders in the Indian Rare Earths, Kalpakkam, Jaduguda uranium mines, and Kota nuclear plant in India. The fishing communities are already affected with displacement, lack of fish, and many health disorders due to Kalpakkam nuclear plant near Chennai. These communities are also struggling against the massive nuclear energy production plan at Koodamkulam in southern Tamil Nadu and Haripur in West Bengal. Many of the nuclear plants which will come up as a result of the nuclear deal between India and the United States will be in the coastal areas. Ultimately all pollution will end up in the sea. The threat to the fishing communities due to nuclearisation is definitely more immediate. The only permanent answer for problem of climate change is the restructuring of our production process and its replacement with sustainable agricultural production, sustainable industrial production, and sustainable energy production. This is certainly a more complex revolution than all the revolutions in history so far. But such a move will strengthen the lives of the majority of Indian people for generations to come. Unfortunately, the Government of India is heavily promoting unsustainable agriculture, unsustainable industries, and unsustainable energy production. maximum advantage to this sector rather than Indian State as the only negotiating force. The last two points are also intrinsically linked to our production process. The ultimate need is to restructure our dominant world view, a revolution which determines the future of all species including the human beings. The only way is to unite with all like minded activists globally and have common struggles to force some wisdom to our global leaders who determine the fate of this planet.